Headquartered in Germany, Servage One offers a single, fully-featured shared web hosting plan that renews at $6.45 per month for a 1-year term. The firm scores high marks for disk space, bandwidth, and reliability. But while our testing demonstrated 100% uptime, average page-load speeds were disappointing, and varied greatly depending on the test location. Additional negatives include a ‘C’ BBB rating, lack of phone support, a 14-day money-back guarantee, and a few usability issues. The mixed marks combine to produce a rather mediocre total rating that precludes our endorsement. Therefore, Servage One has earned the NCM Online designation of NOT RECOMMENDED. Servage One offers a single shared web hosting plan that includes an abundance of valuable features including a free domain name for the life the account. Like many one-size-fits-all plans, it is configured to accommodate most web sites. Whatever is not included, is generally available at additional cost without the necessity of upgrading to VPS hosting. Unlimited features include websites hosted, disk space, bandwidth, FTP accounts, e-mail accounts, e-mail forwards, auto-responders, and parked domains. Standard features include web builder software, subdomains including wildcard domains, choice of PHP versions, phpMyAdmin, up to 1000 MySQL databases, Cron jobs, IPv6 support, shared SSL certificate, hotlink protection, password-protected directories, mobile WAP, Flash support, webmail access, e-mail spam filtering, traffic stats, proprietary control panel (screenshot below right), proprietary 1-click script installer (screenshot below right), and more. The proprietary Servage One Control Panel. Click to enlarge. Moderately-priced, additional-cost options include a dedicated IP address for only $19.95 per year ($1.66 per month), and a secure SSL certificate for only $34.95 per year ($2.91 per month). A VPS (virtual private server) upgrade is available for only $179.52 per year ($14.96 per month). It includes 1 core, 600MB of RAM, 150GB of disk space, and 5TB of bandwidth. Servage One hosting plans are backed by 24/7 chat and ticket support and a 14 day (or is it 5 day?) money back guarantee. This page says “5-day,” while this page says “14 day.” We contacted support for clarification. 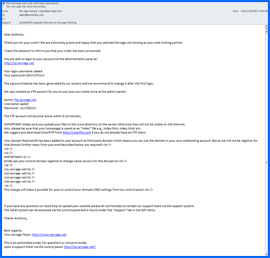 They confirmed that the web hosting money-back guarantee is 14 days. Servage One utilizes a surprisingly simple, 2-step checkout process. Step 1 required form fields include country, username, e-mail address, and a choice of Domain Hosting (free), VPS Hosting, or Webhosting. Initial/renewal pricing is clearly indicated. Shared hosting term options include 24 months at $4.45 per month, 12 months at $6.45 per month, 6 months at $7.95 per month, and 3 months at $7.95 per month plus $14.99 setup fee. All hosting terms automatically renew at the initial rate. Step 1 concludes with a form field for the domain name you wish to associate with the account. The proprietary Servage One Autoinstaller. Click to enlarge. Step 2 requires the entry of contact information as well as the selection of a payment method. Available options include Visa, MasterCard, Maestro, JCB, Amex, PayPal, Skrill, bank transfer, and cash (we have purchased many hosting plans, but this was the first time we had ever seen cash as a payment option). After entering our contact information, we selected our preferred payment method, PayPal, agreed to the Terms of Service, and clicked the “Order and pay now” button. The Servage One “Welcome” e-mail (screenshot below right) arrived in our inbox less than 5 minutes after placing our order. While it did include all of the information required to set up our website quickly — including the nameservers and FTP login, it failed to indicate that using a domain name registered with another registrar would require us to use the control panel to manually associate the domain with the hosting account. Unaware that our domain name had not automatically been associated with the hosting account, we pointed the third-party nameservers to Servage One, and then uploaded our simple 1-page test site via FTP. We waited patiently for the DNS to propagate. After some time, we logged into the control panel to investigate. As we had run into the issue with a few other hosting services, we surmised that the domain name must be added to the hosting account manually. We used the Domains screen of the Servage One control panel to add our domain to the hosting account. Shortly thereafter, we were able to access our test site via a web browser. While we’d prefer not to dwell on the domain name matter, we felt that Servage One “Welcome” e-mail had done a poor job of explaining what was required for websites using domain names maintained by a different registrar. Servage One “Welcome” e-mail. Click to enlarge. 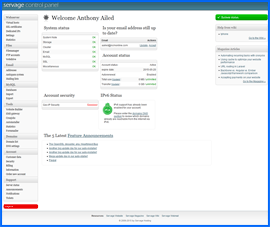 Servage One provides web hosting customers with a proprietary control panel (screenshot above right) that includes billing and account functions in addition to website management tools. While not as aesthetically pleasing as cPanel, we found it to be easy to use and quite capable of handling webmaster functions with a minimum of fuss. 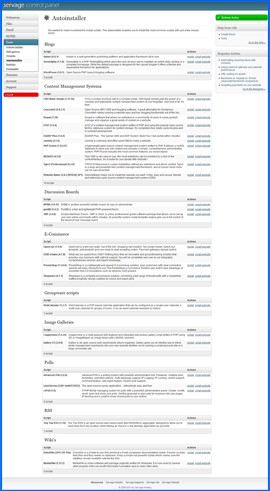 The Servage One Autoinstaller (screenshot above right) provides for quick installation of 29 popular website applications including WordPress, Concrete5, Drupal, Joomla, MyBB, SMF, OpenCart, PrestaShop, WebCalendar, Coppermine, Advanced Poll, Lime Survey, Tiny Tiny RSS, MediaWiki, and others. As it does not include all of the 100+ applications generally available with the Softaculous Applications Installer, we would suggest that potential customers contact Servage One prior to any hosting purchase to determine if required applications are supported. It should also be noted that the Autoinstaller provides the fastest and easiest WordPress installation we have ever seen. To install WordPress, one need only enter the desired directory for the install (leave blank to install in the root) and click the “Start Installation” button. The numerous options selected during Softaculous installations may be configured post-installation using the WordPress dashboard. 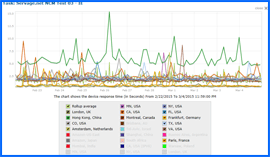 Servage One Web Hosting 10-day Uptime Test Results Chart. Click to enlarge. Speed and reliability testing began on 2/22/15 and concluded on 3/4/15. Utilizing our simple 1-page test site, Servage One was subjected to a total of 1054 server checks from 13 worldwide locations over the course of the 10-day test period. We are pleased to report that they achieved a perfect, 100% uptime score (see Uptime Test Results screenshot right). However, the page-load speed test results were disappointing. Servage One recorded an average speed of 1.9767 seconds to load our test site from 13 locations worldwide, and 2.2191 seconds from 7 U.S. locations (see Speed Test Results screenshot below right). It is noteworthy that this is the first time our testing recorded slower average page-load speeds in the U.S. than worldwide. Surmising that the Servage One datacenter was located in Europe, we decided to take a closer look at the results. Servage One Web Hosting 10-day Speed Test Results Chart. Click to enlarge. We divided our 13 test locations into three groups: North America (Montreal, New York, Virginia, Florida, Minnesota, Dallas, Colorado, and California); Europe (London, Paris, Amsterdam, and Frankfurt); and Asia (Hong Kong). We then averaged the page-load speed data for each of the three groups over the course of the same 10-day test period (2/22/15–3/4/15). The results varied markedly between groups. The North American group averaged a distinctly slow 1.9976 seconds to load the simple 1-page test site. The European group averaged a lightening fast 0.7162 seconds to load the same test site. The Asian group recorded perhaps the slowest page load speed to date, averaging a glacial 6.0081 seconds to load the very same test site. The results were clear. While Eurocentric websites may well benefit from Servage One web hosting, North American and Asian websites would almost certainly suffer for it. Third-party domain names must be added to accounts manually. Despite a number of positives, slow page-load speeds, usability issues, lack of phone support, and a limited money-back guarantee prevent our endorsement at this time. Servage One has earned 3.5 stars and is not recommended. Cheap website hosting company price comparisons based on 1-year term list price before coupon/promo codes or limited time/introductory offer discounts. These are the renewal rates for the second year of hosting. To ensure that you receive the most affordable Servage One Web Hosting pricing possible, please visit our Web Hosting Coupon Codes page for current discounts and special offers before making any purchases. In 1998, Servage One Hosting was created by Steffan Søndermark Fallesen. It has since been established as an experienced and financially independent hosting company currently hosting 196845 websites. The name “Servage” is combined from words “serve” and “age” illustrating the ideals the company holds to always best serve their customers and continually keep their systems modern by using the most up-to-date technologies. Some of the most prestigious awards of the industry have been given to Servage decided by high-profile outlet editors and readers. They have constantly received titles such as “Best Overall Webhost”, “Outstanding”, “Best in Test”, and “Editor’s Choice” always pulling in top ratings. Servage One is one of the top reliable and most technically advanced website hosting services currently available offering a next generation webhosting platform. The company boasts a clustered platform that completely revolutionizes how webhosting works when comparing to traditional platforms. They prevent downtime as all their systems are placed in redundant setups with the servers mirrored in a way they cannot fail. Other cluster nodes will automatically replace a malfunctioning server. Servage has developed solutions with a history of one hundred percent uptime. With servers that include load balancers in the datacenter with emergency power in event of an electrical grid failure and redundant setup that has gigabit Internet connections, there is almost no chance to experience service interruptions. They have a Super-Node structure which means webpages are not present in a single server. The webpages are located on multiple servers inside their cluster. 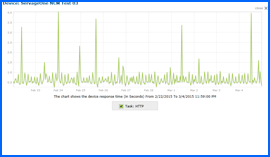 Therefore, when someone accesses a website, they are automatically brought to the quickest server in the cluster. This provides a fault tolerant setup, as well as, an increase in access speed. A malfunctioning cluster does not prevent visitors from accessing the site as it is spread over the other remaining servers still allowing them to see any page at the normal speed. The setup of this system took a great amount of time and monetary resources, but the company feels this good investment is worth it. They have seen the increase in customer loyalty and satisfaction due to this advance. Servage One staff is always available at all hours of the day, every day of the year to provide quick and helpful assistance. Any support channel used will deliver a fast response with the average response time being twenty minutes. Servage constantly works to fulfill its main goal of complete customer satisfaction. They understand that this greatly depends on their webhosting customer services, cluster reliability, and speed. They are dedicated to keeping their customers satisfied in order to ensure success in the long run in the competitive market. This video tutorial will show you exactly how to install WordPress on your Servage One shared hosting account using their proprietary control panel and applications installer.